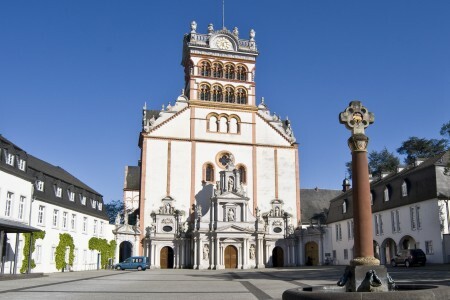 The Abby St. Matthias’s is located toward the south end of the city. 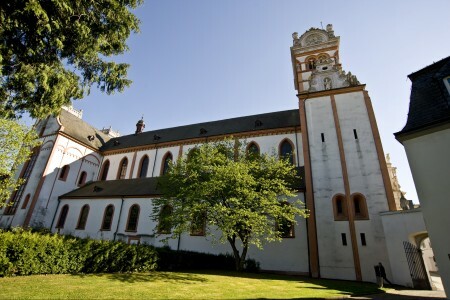 The abbey is one of the most significant structures in Trier and holds countless art treasures. Presumably the first Christian community in Gaul originated here. Primarily the first Trier bishops, Eucharius and Valerius, were venerated in this probably oldest Christian church in Germany. The present church was built in 1127. It was then that the presumed relics of the Apostle Matthias (the Apostle who replaced Judas) were found; his remains had previously been very well hidden to protect them from plundering. Since that time, the Apostle’s grave has been the goal of numerous pilgrim groups. 04/21/2019: 08:00 a.m. - 7:00 p.m.
04/22/2019: 08:00 a.m. - 7:00 p.m.
04/23/2019: 08:00 a.m. - 7:00 p.m.
04/24/2019: 08:00 a.m. - 7:00 p.m.
04/25/2019: 08:00 a.m. - 7:00 p.m.
04/26/2019: 08:00 a.m. - 7:00 p.m.
04/27/2019: 08:00 a.m. - 7:00 p.m.
04/28/2019: 08:00 a.m. - 7:00 p.m.
04/29/2019: 08:00 a.m. - 7:00 p.m.
04/30/2019: 08:00 a.m. - 7:00 p.m.
05/01/2019: 08:00 a.m. - 7:00 p.m.
05/02/2019: 08:00 a.m. - 7:00 p.m.
05/03/2019: 08:00 a.m. - 7:00 p.m.
05/04/2019: 08:00 a.m. - 7:00 p.m.
05/05/2019: 08:00 a.m. - 7:00 p.m.
05/06/2019: 08:00 a.m. - 7:00 p.m.
05/07/2019: 08:00 a.m. - 7:00 p.m.
05/08/2019: 08:00 a.m. - 7:00 p.m.
05/09/2019: 08:00 a.m. - 7:00 p.m.
05/10/2019: 08:00 a.m. - 7:00 p.m.
05/11/2019: 08:00 a.m. - 7:00 p.m.
05/12/2019: 08:00 a.m. - 7:00 p.m.
05/13/2019: 08:00 a.m. - 7:00 p.m.
05/14/2019: 08:00 a.m. - 7:00 p.m.
05/15/2019: 08:00 a.m. - 7:00 p.m.
05/16/2019: 08:00 a.m. - 7:00 p.m.
05/17/2019: 08:00 a.m. - 7:00 p.m.
05/18/2019: 08:00 a.m. - 7:00 p.m.
05/19/2019: 08:00 a.m. - 7:00 p.m.
05/20/2019: 08:00 a.m. - 7:00 p.m.
05/21/2019: 08:00 a.m. - 7:00 p.m.
05/22/2019: 08:00 a.m. - 7:00 p.m.
05/23/2019: 08:00 a.m. - 7:00 p.m.
05/24/2019: 08:00 a.m. - 7:00 p.m.
05/25/2019: 08:00 a.m. - 7:00 p.m.
05/26/2019: 08:00 a.m. - 7:00 p.m.
05/27/2019: 08:00 a.m. - 7:00 p.m.
05/28/2019: 08:00 a.m. - 7:00 p.m.
05/29/2019: 08:00 a.m. - 7:00 p.m.
05/30/2019: 08:00 a.m. - 7:00 p.m.
05/31/2019: 08:00 a.m. - 7:00 p.m.
06/01/2019: 08:00 a.m. - 7:00 p.m.
06/02/2019: 08:00 a.m. - 7:00 p.m.
06/03/2019: 08:00 a.m. - 7:00 p.m.
06/04/2019: 08:00 a.m. - 7:00 p.m.
06/05/2019: 08:00 a.m. - 7:00 p.m.
06/06/2019: 08:00 a.m. - 7:00 p.m.
06/07/2019: 08:00 a.m. - 7:00 p.m.
06/08/2019: 08:00 a.m. - 7:00 p.m.
06/09/2019: 08:00 a.m. - 7:00 p.m.